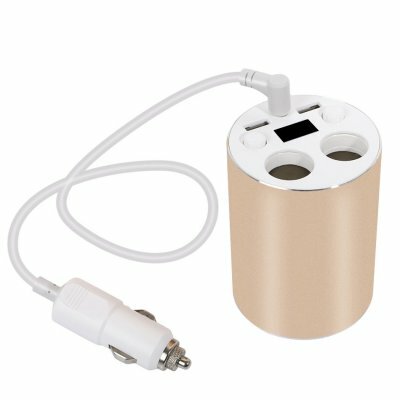 Successfully Added Car Cup USB Charger - 45CM Cable, Dual 80W Cigarette Output, Dual USB Port, LED Display, Explosion-Proof (Gold) to your Shopping Cart. With this multifunctional car cup charger at your disposal, none of your electronics will ever run out of juice again while driving your car. With its plug and play design, all you have to do is insert the car plug charger into your car cigarette output and you’ll be able to transfer your car’s energy into your smartphone, tablet, and other electronic devices. Perfect to charge your phone on the go or to supply power to your passenger’s tablet or portable DVD player while waiting to reach your upcoming destination – this truly multifunctional device will make sure that none of your passengers will ever need to feel bored again. Coming with two USB ports and two additional 80W cigarette outputs, this USB power charger allows you to charge numerous of your electronic devices at once. Thanks to its Dual-USB ports, you and your passengers will be able to charge your phone – ensuring that you’ll always be within reach and providing your passengers with the possibility to watch movies, play games, and browse the web for hours in a row without ever again needing to worry about battery life. Simply connect this car USB charger to your car’s cigarette lighter and you, along with all your passengers, will be treated with an unlimited power supply for all your electronics. Along with its two USB ports, this car cup charger furthermore features two extra 80 Watt cigarette outputs which can be used to power additional car accessories such as a miniature fan or air purifier. Equipped with an extra long 45CM power cable, this USB charger can be placed anywhere within your car – providing not only the driver but also people sitting in the back with all the power they need to stay entertained throughout the trip. This car USB charger has been made from a heat-resistant material – assuring that it can be used safely for numerous hours in a row without you needing to worry about it heating up. With built-in protection against power surges, overheating, and short circuits, this USB charger guarantees a safe usage. This car USB charger comes with a 12 months warranty, brought to you by the leader in electronic devices as well as wholesale electronic gadgets..
Protects your device from power surges, short circuits, and overcharging. Arabic: - لأن تحميل USB - Chinese Simplified: - 因为 USB 加载 - Czech: - Protože USB zatížení - Dutch: - Omdat USB geladen - French: - Car USB Charger - German: - Da USB laden - Hebrew: - מאחר USB לטעון - Hindi: - क्योंकि USB लोड - Hungarian: - Mert USB betöltése - Italian: - Perché caricare USB - Japanese: - USB を読み込むので - Korean: - USB를 로드 하기 때문에 - Malay: - Kerana memuatkan USB - Norwegian Bokmål: - Fordi USB laste - Romanian: - Deoarece USB de încărcare - Russian: - Поскольку загрузка USB - Spanish: - Porque carga USB - Thai: - เนื่องจากโหลด USB - Turkish: - USB, çünkü - Vietnamese: - Bởi vì USB tải.